The Asian Hornet has not yet arrived but it probably will. As beekeepers we care because the Asian Hornet loves to eat bees - an easily available source of fresh food. As anybody else we should care because the Asian Hornet does not just eat honey bees. The Asian Hornet eats many types of insects and those insects are the pollinators of our flowers. 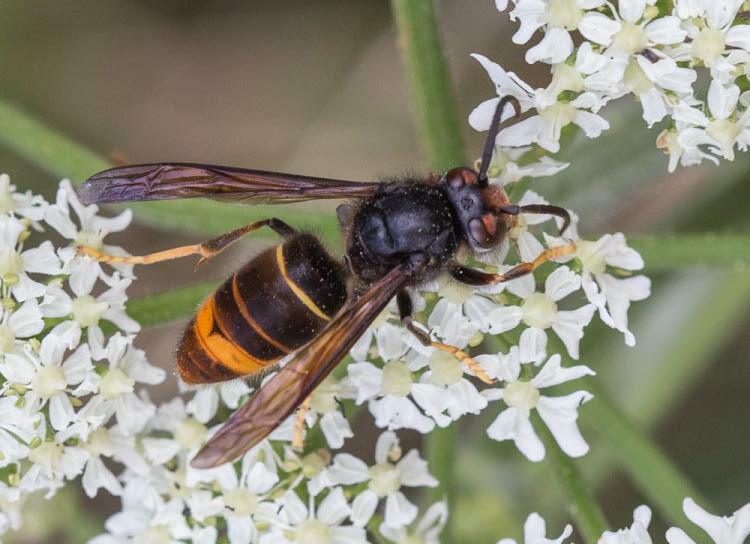 A serious invasion by the Asian Hornet could have a serious affect on our environment. Note the single yellow band on the abdomen and the yellow socks. What do I do if I find one? If you can take a photo and then report it. One of the easiest way to do this is to install the Asian Hornet app on your phone. Do this by going to your App store and doing a search for 'Asian Hornet' and download it. This will assist you in identification and then if you are convinced it is an Asian Hornet you can report it and your location using a single button press. There are Asian Hornet traps available. These can be purchased from a variety of bee equipment suppliers such as Thornes, Maisemore and Bee Equipment. Alternatively you could make your own following instructions from the National Bee Unit or follow this video from the Animal and Plant Health Agency.